Son of Sobek - Percy Jackson and the krokodil scene.. . Wallpaper and background images in the The Heroes of Olympus club tagged: percy jackson and the olympians the kane chronicles the heroes of olympus son of sobek fan art crocodile crossover. LUV THIS PIC!! sooooo funny! "Hey i have a crocodile to catch!" @JasmineValdez: lol that's what I thought! Oh my gods! They FINALLY met!!! Waiting 4 this since I first met the two in the books! i wonder when this takes place, before or after the serpents shadow? and before or after the HoO? oh. so then percy should no all about the egyptians then, right? wait, he lost his memory. octavian is gonna freak. 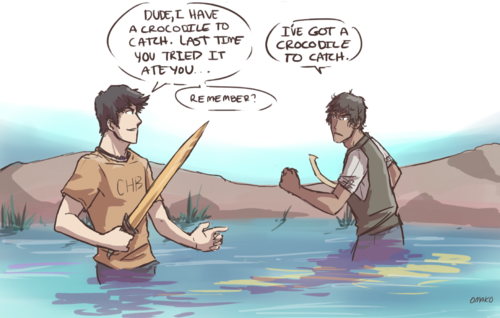 LOL and Thar's Percy Jackson and Carter Kane. Love the books! I wonder if that's how percy and annabeth get out of traturs(idk if that's how u spell it I don't have by book with me)they call on carter to get them out?????? ?